The three colony-stimulating factors (GM-CSF, G-CSF, and M-CSF) and IL-3 are the major paracrine-autocrine regulators of hematopoiesis. A summary of their biochemical properties is given in Table 15-12. Their major biological action is to stimulate the proliferation (i.e., amplify the number of cells) of selected points in the erythroid and myeloid lineages. Erythropoietin is a hematopoietic hormone secreted by the kidney that functions as a major stimulator of the production of erythrocytes. Erythropoietin is a secreted glycoprotein of 165 amino acids, but with a mature molecular mass of 30-34 kDa due to the presence of a significant amount of covalently linked carbohydrate. Hypoxia (a low-oxygen environment) can stimulate the synthesis of erythropoietin mRNA in the renal capillary tubular cells by an unknown mechanism(s). The erythropoietin receptor belongs to the cytokine receptor superfamily (see Figure 15-21). In the adult human, erythropoietin is a classic hormone, secreted by the kidney and transported systemi-cally to its site of action in the erythron. However, in the fetus, it is a paracrine-autocrine agent since the liver is the major site of production of both erythropoietin and erythropoietic cells. FIGURE 15-20 Schematic diagram of the general scheme of blood cell differentiation, including an indication of the role of hematopoietic hormones and cytokines. All of the cells of the hematopoietic cell system are derived from a pluripotent stem cell; this cell can differentiate to generate the daughter stem cells that support the production of the lymphoid and myeloid lineages. 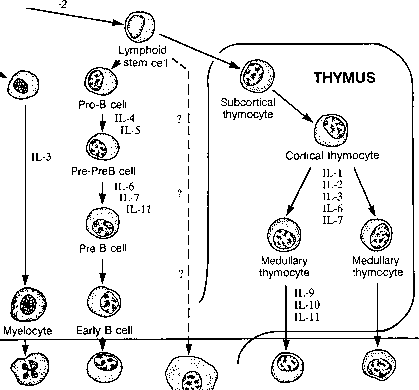 The lymphoid stem cell supports the production of the B and T lymphocytes. The myeloid stem cell supports the production of the reticulocyte-erythrocyte, the megakarocyte, and the monocyte and granulocyte lineages (see Table 15-10). The different progenitor cells that are identified in the in vitro culture systems are ÇFU-GEMM (colony-forming unit, granulocyte-erythrocyte-monocyte-megakaryocyte), CFU-Meg (CFU, megakaryocyte), CFU-GM (CFU, granulocyte-monocyte), CFU-E (CFU, erythroid), and BFU-E (burst-forming unit, erythroid). The abbreviations of the regulatory cytokine factors are defined in Table 15-11. Note: The proposed sites of action of the cytokines, which are likely to change, are an area of intense investigation. The assignments shown here were derived from Metcalf, D., Nicola, N. A., and Gough, N. M. (1995). Hormones and blood cell production. In "Endocrinology" (L. J. DeGroot et al, eds. ), Vol. 3, p. 2943. W. B. Saunders and Co. New York. 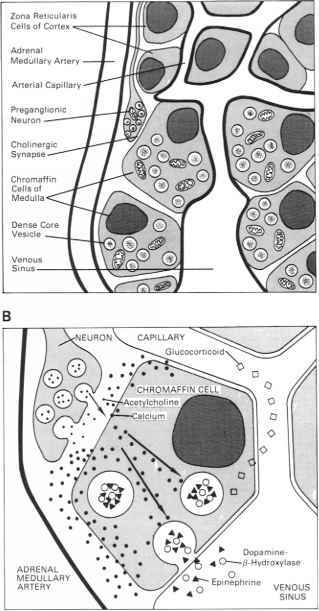 This figure was modified from the original by Clark, S. C., and Kamen, R. (1987). The human hematopoietic colony-stimulating factors. Science 236,1229-1237; the updated information was extrapolated from both a "Hematopoetry" poster (1993) prepared by the Genzyme Corporation, Cambridge, MA and a poster (1993) prepared by Harlan Bioproducts for Science, Inc., Indianapolis, IN.